It’s been said that the only thing that matters in a startup is achieving Product Market Fit. So what is it exactly? And how do you know when you’ve achieved it? Marc Andreesson coined the term in 2007. He says “Product/market fit means being in a good market with a product that can satisfy that market.” Let’s break that down a bit. A good market – customers have a problem that they will pay money to solve. There’s either a lot of customers that will pay, or a few customers that will pay a lot. With a product – this is your service that customers are paying for. Satisfying the market – your product solves the problems customers are having. They are happy to pay for your service, and satisfied with your company. Having Product Market Fit means that enough customers will happily pay you money to resolve their issues. If customers either don’t see the value of your product, or you’re unable to acquire enough customers to keep afloat – you don’t have product market fit. When you’ve achieved product market fit, life gets a whole lot easier for your startup. Customers are sticking around, you’re able to charge a fair price and word of mouth is spreading. If you don’t have product market fit, you’ll feel it too. Acquiring customers is hard work, churn is increasing, usage is low. It’s like pulling teeth to keep the business from going under. Finding the right market and being able to satisfy it will mean that you can grow faster and more efficiently. We’ve written a full blog post on running our product market fit survey, but we’ll break it down a little here too. The best way to quantitatively measure your product market fitness (we just made that up) is to ask customers how they’d feel if your product wasn’t around anymore. The more disappointed, the better your product is fulfilling their needs. You’ll want to include a follow up question asking customers to elaborate on their answer – this will be helpful later on! If at least 40% of your customers reply that they’d be very disappointed, congrats! You’ve likely achieved product market fit. 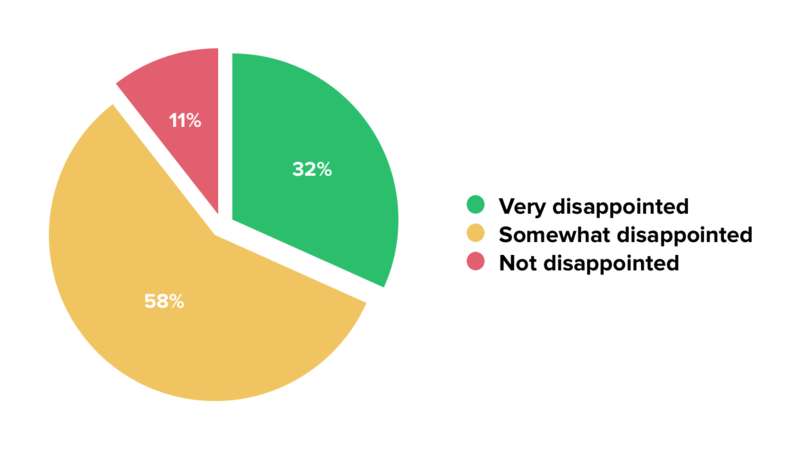 Here’s our survey results from the first time we ran this survey in April 2015. We were pretty close back then. You can also use NPS, churn and referrals to determine how close you are to product market fit. But beware – it’s not a one time, big bang event. It’s a gradient. Improving your product market fit will continue for the lifetime of your product. If you’re following our advice and launching early, you likely won’t achieve product market fit right out the gate. In fact, you shouldn’t. Launching an imperfect product early gives you a chance to see what works (and what doesn’t) for your potential market. Here’s how to keep improving that Product Market fit. If your customers aren’t buying what you’re selling, you need to understand why. Talking to customers (both existing and potential) about their worries, goals and day to day life will help you make better decisions about what to develop in the future. Schedule customer interviews and attend industry conferences, and keep your ears open! If you run a product market fit survey, or run an NPS program, you’ll be getting lots of great feedback from customers. Taking the time to read through these replies and building them into your roadmap will make sure you’re heading the right direction. Rome wasn’t built in a day, and neither is your product market fit.